As expected, Music by the Lake has secured a stellar lineup of talented and diverse performers for its 2012 season. The popular summer music series is held on the campus of George Williams College (GWC) of Aurora University in Williams Bay, Wis. Over the years, it has hosted such headliners as Maureen McGovern, Brian Stokes-Mitchell, The Kingston Trio, Kenny Loggins, The Irish Tenors and Peter Frampton. 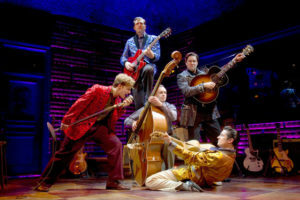 Under the leadership of Executive Director Christine Flasch, now in her 12th year, it continues to attract well-known national and international performers. Flasch barely took time to savor the success of last season, which ended in August, before she began working on this one. But landing a certain act or artist isn’t always about the fee. Performer contracts contain riders – certain stipulations – that must be met or carefully negotiated. 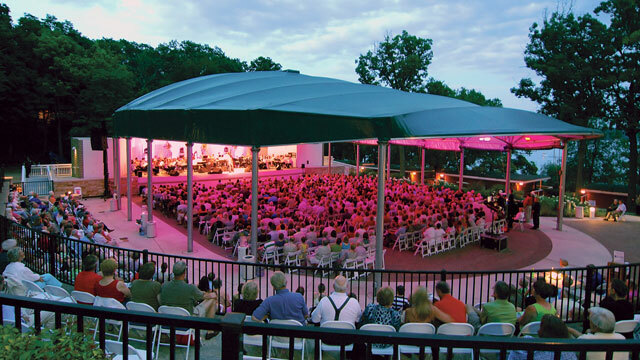 For instance, Music by the Lake’s venue is the open-air Ferro Pavilion, designed specifically for concerts. Dressing room facilities are located up the hill from the venue, in beautiful Brandenburg Hall, not in the theater itself. It’s a comfortable place to relax, have dinner and dress before the performances. But agreement must be acquired from agents before arrangements are solidified. Flasch must also deal with concert riders that might involve, for instance, providing a certain kind of instrument or specific brand of food or beverage. In addition, performer availability can change suddenly, so Flasch must always have what she calls “an excellent Plan B, and even a Plan C.” But after 12 years, she knows to be prepared. Kicking things off on July 7 is Steve Lippia, in “Simply Sinatra.” This popular singer, backed by his own 16-piece orchestra, performs all of Old Blue Eyes’ hits. “He looks a bit like Harry Connick, Jr., and he’s got the smooth style of Sinatra,” says Flasch. Next up is Music in the Air, a 1930s Jerome Kern/Oscar Hammerstein musical that few people know of, but which has Flasch very excited. The plot involves a group of provincials from a small Bavarian village who head to the big city of Munich, to assist their aging music teacher in getting a song published. Of course, their homey rural values clash with the urban cynicism of the people they meet. At press time, she was still negotiating to cast the all-important lead, Dr. Walther Lessing. In the other three roles are Chicago Shakespearean actor Larry Yando, versatile stage and screen performer Charles Stransky, and actor/musician Steve Malone. Favorite Chicago soprano Alicia Berneche and New York City-based baritone Christopher Burchett round out the lead characters. “This cast will bring new life to this lovely piece,” says Flasch. Returning for the second season in a row is popular singer/songwriter Tom Chapin, for the Family & Children’s Concert. “We don’t usually book someone for back-to-back seasons, but Chapin had such a strong response that we’re sure he’ll be a big draw again,” says Flasch. Visitors attending Music by the Lake may rent rooms overnight on the GWC campus, some with porches overlooking beautiful Geneva Lake. A $2 million renovation and expansion of the school’s historic 1926 Mabel Cratty Hall has been completed, and the Prairie-style building, adjacent to Ferro Pavilion, will be open for tours. Also, shopping and fine dining experiences await in Williams Bay and nearby Lake Geneva. Music by the Lake audiences can choose seating on the lawn (bring your own seats), on the uncovered terrace, or under the pavilion, in dress circle, orchestra or rear orchestra sections. Season ticket packages and single tickets are available online at musicbythelake.com, via email to mbtl@aurora.edu, or by phone at (866) 843-5200. Sunday, July 22, 4:00 p.m.
Sunday, August 5, 4:00 p.m.
Sunday, July 29, 4:00 p.m. This entry was posted on Thursday, May 24th, 2012 at 11:59 am	and is filed under Arts & Entertainment. You can follow any responses to this entry through the RSS 2.0 feed. Both comments and pings are currently closed. We plan to be in Lake Geneva Aug. 16-20. Will you have a program during that time? If so, what is it? Thank you.